Flat feet are also known as fallen arches. This dire problem occurs in a high number of people. Flat feet can especially limit people to an active lifestyle. They tend to get uncomfortable when they stand for long periods of time. 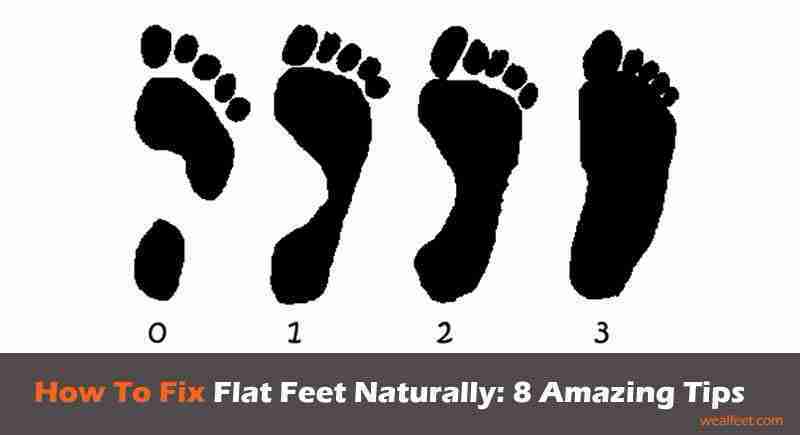 If you have flat feet, you definitely must have been wondering how to fix flat feet naturally. Some factors that could contribute to this problem include heredity. Underlying conditions like diabetes, obesity, and high blood pressure are huge risk factors. Don’t rush and take the easy way out with methods like financially draining surgeries. Consider the option of fixing flat feet naturally. Shoes play an important role in fixing flat feet naturally. The right shoes will provide comfort as one goes about their daily routine. Shoes with a raised sole are recommended and are beneficial as they as they offer support to the feet. One crucial thing is that you should try to avoid flat shoes. Do this as much as you can because they put so much pressure on the heel and hence cause so much pain and discomfort. You should not go overboard with high heels either. They cause the tightening of the Achilles’ tendons which will, in turn, give you days of agony. When buying new shoes, you should consider going for the fitting after midday. The foot is usually at its largest size during that time, hence, will provide the most comfortable fit. But if you must buy shoes at any other time when the foot has shrunk, try to buy one size larger. Ensure there is ample space between the big toe and the edge of the shoe. Remember, comfort should always come first any day. Obesity contributes to flat feet in some circumstances. The excess weight on your body sometimes presents a burden to the bone ligaments and tendons of the feet. Shedding weight will reduce the amount of work the arch needs to work to maintain its shape. The major disadvantage of obesity is that the excess weight causes poor blood circulation. This may affect the supply of blood to the tendons which would then cause major weakness. Weakness in the tendons will eventually cause the arch to collapse. Start slowly with exercises and diet to promote healthy weight loss. Eat plenty of vegetables and proteins, avoid refined carbohydrates as much as possible. It’s important for someone with flat feet to do some custom exercises. These include stretches and foot strengthening exercises. They provide the much-needed relief to the bones. One important note is that you should avoid running on the tarmac as it might hurt you. The basic exercises to strengthen your feet include spreading your toes. Let them be far and wide. Flex your feet often and walk on tiptoes several minutes a day. You can also try standing and balancing on one foot and delicately jump. This will go a great way to promoting the healthy development of the feet. It is believed that running or walking barefoot will reinforce the muscles of the lower legs and feet. It should be noted that pushing yourself too hard will only bring more harm than good. Just go slow at our own pace. When you start feeling a dull ache, take a step back and relax. Orthotics are shoe inserts. They are used in place of factory insoles. They help in providing support to the arch of the foot. They take so much pressure from the mid-foot. This will reduce the discomfort and pain. Especially in people who spend most of their time walking or standing. Visiting health professionals like podiatrists and physiotherapists is important. They will help you get your custom made orthotics. They don’t cost much, but they will go a long way into giving your feet greatest comfort. This might cost you, but it’s worth it. For orthotics to be effective, you should put them in your shoes all time. Hand-me-downs can be particularly tempting if you are trying to save an extra coin. For a person with flat feet, this might not be the option for you. Shoes with more than one wearer will have taken the shape of the other person’s feet. They will not provide your arches with the necessary support it badly needs. Stop pushing your body too hard. Getting plenty of rest is important. Mainly if you have spent so much time on your feet top avoid causing your body more pain than it can handle. This will ruin the process of healing. High impact physical activities should be avoided at all costs. When you feel the pain is too much at your feet, you can place some ice on them to give you instant relief. Whenever you can try to walk or exercise barefoot. The direct contact with surfaces activates nerves. These are nerves that would have otherwise been muted had you had shoes on. This is also important in upholding a solid balance and upright posture. It’s important to mind your health always. Avoid conditions that could worsen the condition. Diabetes and hypertension can be kept at bay by minding your diet. Partake in regular exercises. These diseases limit blood circulation, and this weakens the tendons. You should try to practice all these options of how to fix flat feet naturally. They will go a long way in solving your condition. Do not ignore this problem. It sometimes tends to progress into more severe complications. These might even end up giving you a deformity. It doesn’t hurt to try when you still have the option of fixing it. Do not wait till it’s too late to do anything about it. Most of the options on how to fix flat feet naturally don’t cost a cent. Start now and I can guarantee that you will be feeling so much better within no time.